Processor: Pentium III or AMD Athlon XP and up processor - 2.4 GHz and up. 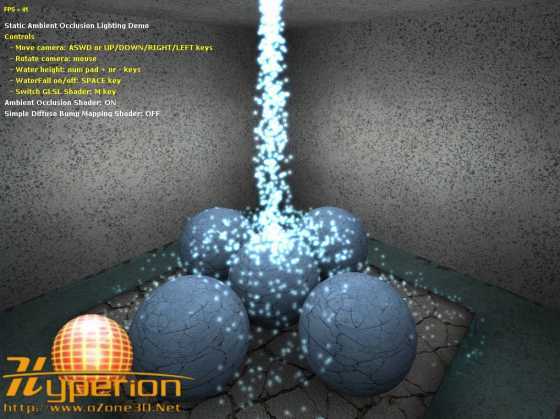 This demo focuses mainly on Ambient Occlusion Lighting. For more details, please refer to the tutorial about this topic: [:: Static AO tutorial ::]. 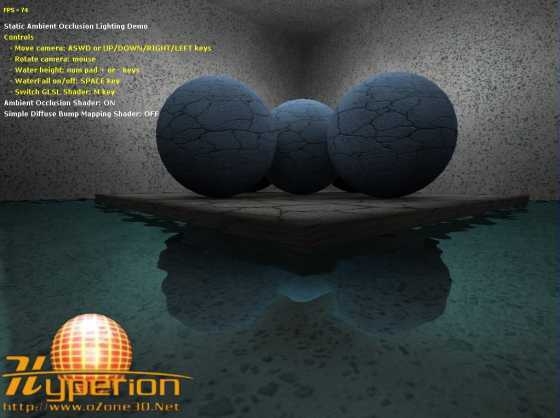 This demo also shows how to make a realistic water reflexion. The principle is to render the reflexion in a texture (named water_reflect_tex in the code) and to use this texture in the GLSL reflexion shader (waterShader in the code). 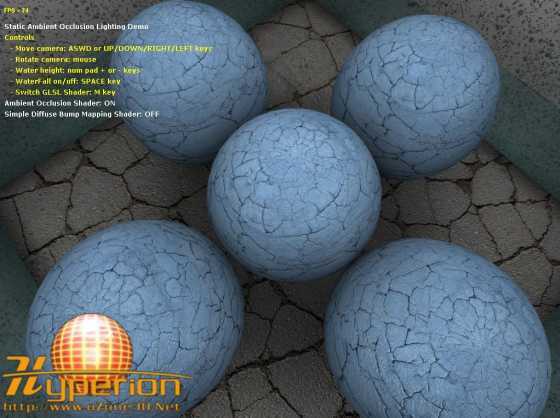 A normal-map is used in this shader to simulate the surface movements. The little trick which slightly increases the realism is the intensity of the reflexion which varies with the angle between the normal to the water surface and the camera. The closer to zero is this angle (the camera plane faces the water), the weaker the reflexion will be (one can see the bottom of the water). Actually, the shader uses the alpha value instead of the reflexion coefficient, which allows to create more or less transparency. Static_AO_NVIDIA_Demo.xml if you have a nVidia graphic controller. 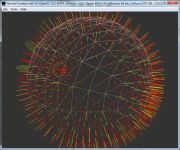 Static_AO_ATI_Demo.xml if you have an ATI graphic controller. The SPACE key will activate the water fall (particle system). By default, these particles are in point_sprite mode. The rendering speed may be increased by the hardware (if the graphics controller offers the point_sprite support). The M key allows to change the main shader for scene rendering. The default shader (AmbientOcclusiobLightingShader) performs a rendering in ambient occlusion bump mapping. The second shader (BumpMappingShader) will render the scene only in bump-mapping. This let us realize the contribution of the AO. It should be noted that the specular component is not taken into account in the shaders. The occlusion-map has been generated by the following tool: [:: AOGen ::]. Page generated in 0.0032768249511719 seconds.